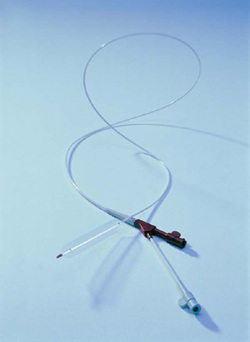 The Valvuloplasty catheter features maximum steerability and trackability. Due to its low profile, it can be handled with the smallest introducer sizes. ​The VACS III valvuloplasty catheter is a high pressure balloon catheter intended for PTV therapy. The catheter offers excellent steerability and is easy to place due to its flexible shaft structure. The extra strengthened high pressure balloon segment requires the use of an appropriately sized introducer set. Nominal sizes of the distal mounted balloon are maintained over the entire length of the balloon.